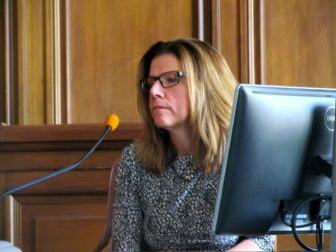 Tracy Snyder, a science teacher at East Hartford High School, was being asked to explain to a Superior Court judge how so many students who read and do math at an elementary-school level ended up in her ninth-grade classroom. “This is the only place we have to put them,” she said. Her school is not alone in promoting students to the next grade – even when they are not prepared for the material in the next teacher’s classroom. After hearing several of these stories – and observing a yawning discrepancy between graduation rates and how many students do poorly on their state exams in high school or must take non-credit courses in community college to catch up on things they should already have learned – Hartford Superior Court Judge Thomas Moukawsher ruled that the state is defaulting on its constitutional obligation to provide every student with a minimally adequate eduction. After a five-month trial, Moukawsher found that the state’s overall spending on education meets this constitutional requirement, but the way the state distributes money and sets standards is not effective or rational, and is therefore unconstitutional. State lawmakers and the education department have been “standing on the sidelines imposing token statewide standards” as too many students move along a conveyer belt of public education, the judge found. Essentially, the state can’t just send money and hope for the best, he ruled. Moukawsher’s blunt assessment came six years after the Connecticut Supreme Court narrowly ruled that the state is responsible for providing students with a “minimally adequate” education and told the lower court to determine if that standard was being met. All aspects of Moukawsher’s decision are now being appealed to the Connecticut Supreme Court, which will again have to wrestle with – and finally decide – the questions that confronted the trial court. While many legislators, the state’s attorney general and Gov. Dannel P. Malloy have said the judge overreached by ordering policy changes that are for the General Assembly and state education officials to determine, it’s not as though legislators and governors haven’t attempted to overhaul the education practices the judge lambasted. But bold reform proposals where the state flexes its rule-making authority have largely stalled at the state Capitol or at the State Department of Education. Among them are proposals to hold back students who cannot read by third grade, set graduation standards based on passing exit exams, evaluate teachers partly on the basis of student test scores, increase required courses and pay educators based on more than just seniority and the degrees they hold. A major point of contention is how much control local school districts should have – and whether and under what circumstances the state can enforce standards it thinks are best. Education Commissioner Dianna Wentzell is sworn in to testify. 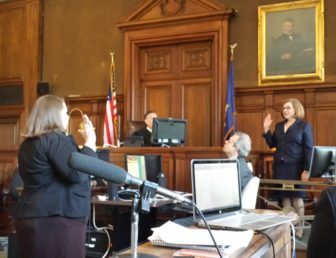 “That’s a local district responsibility,” Education Commissioner Dianna Wentzell told the judge, explaining that the state leaves it up to local educators to determine whether a student has earned a high school diploma. The State Board of Education does have the authority to take over local school boards, appoint special masters and reorganize failing schools. But the state has only done so after local officials, and often labor unions, had reached a consensus that such intervention was necessary. When Bridgeport’s interim school superintendent asked the state earlier this year to mandate training for the city’s rancorous, locally elected school board – the only step the State Department of Education would have to take before it could take over local schools and replace board members – she was turned away. Moukawsher, however, ruled that the state constitution makes the state government ultimately responsible for ensuring students receive a suitable education. That responsibility, he wrote, can not be passed off to local districts. “The state knows it can’t keep up the pretense that local schools are local problems, but it seems numb to the logical implications,” Moukawsher said. He pointed to the droves of students from low-income districts who are multiple grades behind in reading and math, and said improvement has been minimal. “To keep its promise of adequate schools for all children, the state must rally more forcefully around troubled schools,” he wrote. 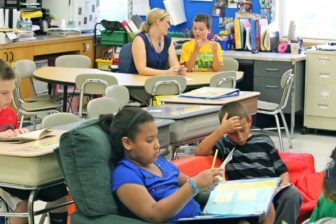 At Anna E. Norris Elementary School in East Hartford, students struggling to read gather in small groups for specialized tutoring for 30 to 45 minutes each day as part of a state-funded pilot program. The attention has produced results. Marcy Deschaine, an elementary school teacher in Bristol, assesses a student. The program helps teachers better identify which students are struggling and in what areas (such as fluency, phonics or comprehension) before providing them additional help. As the mostly minority students in the pilot received extra help, the difference in performance between them and their peers in more affluent districts significantly narrowed – an accomplishment in a state that has some of the largest achievement gaps in the country. Research shows that students who can’t read by Grade 3 are far more likely to drop out of high school. Many educators testified during the trial, however, that they have been unable to implement this approach at their schools because they don’t have enough staff to work with such small groups. So instead of providing extra support for every student who falls behind, teachers and principals decide who will get help. Some choose children who are miles behind, and others pick those who are closer to catching up. “Teachers are making those decisions every day. And they are making those decisions within their heart, and thinking, ‘What would I want for my kid?’ We just don’t have the manpower,” testified Ana Rocco, principal at Ellsworth Avenue School in Danbury. At her school, where half of the students are not reading at grade level, students on the cusp of being where they should be get the added help. 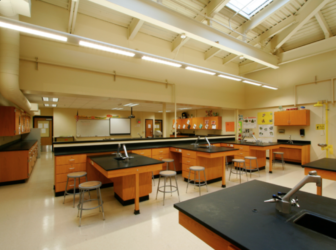 Students who are significantly behind – one in five students – have to wait. At Roosevelt School in Bridgeport, only the students who are furthest behind get extra help and remaining struggling readers have to wait. “That child is not going to get any intervention because there isn’t anyone there to do it,” testified Jacqueline Simmons, principal of the school. At Smalley Academy in New Britain, there is extra help for about half the students who fall behind in English and no help for struggling math students. “It’s a tradeoff,” testified Principal Elsa Saavedra-Rodriguez. Eight years ago, the state adopted standards requiring early identification and added support for students falling behind. This approach is aimed at ensuring struggling students don’t have to have a learning or physical disability to get extra help. A graphic illustrating the tiered system for intervening when students struggle to read. The reading standards are based on a three-tiered approach. The first tier includes students who are generally on track. Tier 2 is for students who need some short-term support to catch up. Groups of four to six of these students are supposed to be tutored at least three times a week for at least 30 minutes. 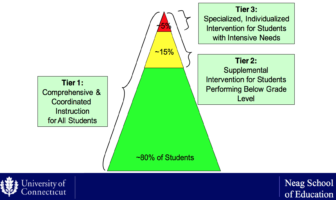 Tier 3 intensifies intervention for students who don’t make sufficient progress in Tier 2. For them, schools are supposed to provide an hour of daily tutoring to groups of no more than three. State education department officials testified that schools could find the resources for this approach by better managing time during the school day and cutting back on other efforts that haven’t been successful. Call it weeding the garden. Daniel Reschly, a professor of special education at Vanderbilt, who has written about implementing this tiered instructional model, agreed. “It’s a matter of reallocating current resources instead of a massive infusion of new funding,” he testified as a witness for the state. Education Commissioner Dianna Wentzell with Gov. 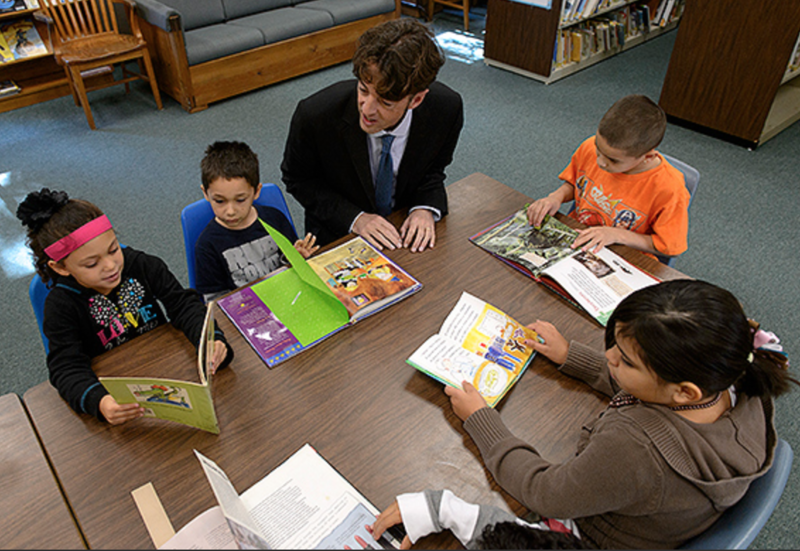 Dannel P. Malloy at a library at an elementary school in Bristol. The judge did not find this argument entirely convincing. “Too little money is chasing too many needs. Wasteful spending cannot be blamed for it all. Incompetent leadership is not the real answer,” Moukawsher ruled. In an opinion piece that ran in the Hartford Courant shortly after his decision, Moukawsher wrote he was a “slow reader” growing up, and that his 15-year-old son has faced similar challenges. The answer, he wrote, is early recognition and support. Rabinowitz helped craft the state standards during her long tenure as a top official at the Connecticut State Department of Education, but she now says it’s impossible for her own schools to follow them. In the five pilot schools that use the program, it took nearly $3 million in additional state funding each year to purchase diagnostic reading tools, provide training to sharpen teachers’ reading chops, and hire additional staff to provide the low student-to-teacher ratios the standards recommend. While Wentzell testified that better time management would pave the way to appropriate interventions for struggling students, state officials also were quick to highlight the tens of millions in additional state aid sent to struggling districts and schools to hire extra help. There have been problems throughout Connecticut in rolling out the standards. According to a 2015 education department survey of 700 local educators, one-third reported they did not have either the staffing or time during the school day to provide Tier 2 or 3 interventions for struggling readers. For students behind in math, nearly half of the educators reported not having the staffing or scheduling time. The state has provided training in the tiered reading program for about two dozen schools, but state officials testified throughout the trial they have received significant pushback from local educators, who say they either don’t have enough staff or that the approach is too prescribed and takes the joy out of reading. In 2012 legislators in the Black and Puerto Rican Caucus, noticed then-current practice was not working and proposed legislation mandating intervention for every struggling elementary school reader and requiring students behind by third grade to be held back. 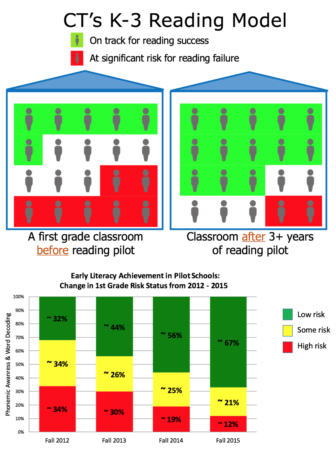 The education department reports that few students are held back – despite the fact that one in four first graders is “substantially deficient” in reading by the end of the school year. 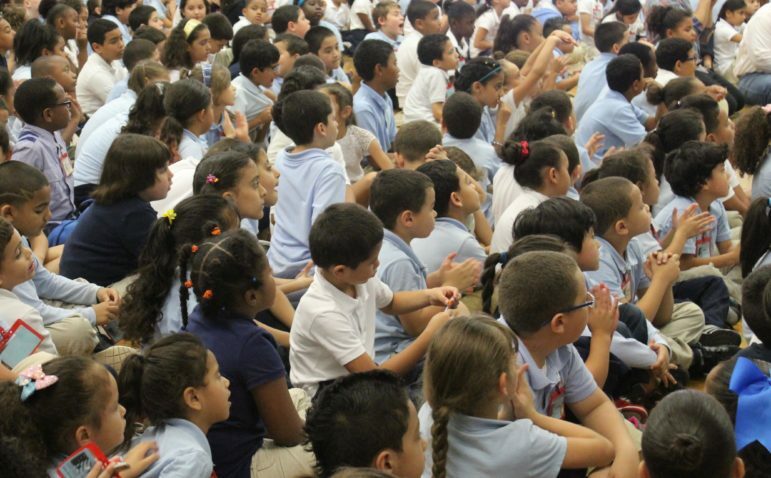 Only 531 of 3,254 struggling first-grade readers statewide were held back in 2012. High cost derailed the caucus’s big idea, despite wide agreement in both chambers that the state needed to do more to improve reading for low-income students. 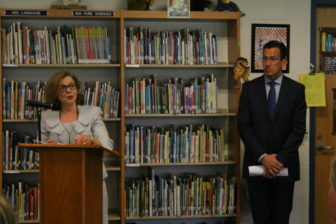 Instead, legislation was approved to expand the reading pilot to a handful of additional schools.